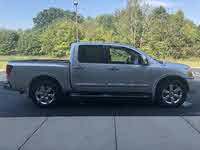 Start a new Nissan Titan question. When I gun it from a stop the back passenger side tire does this sort of skip. What could this be? only my heat is not working everything else is working good. What wrong? Heater only blows out cold air, yet my AC works fine. What do u think problem is? 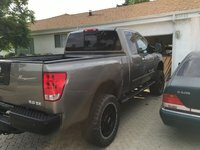 The Nissan Titan is the auto maker's contribution to the full-sized truck market. As the name suggests, the Titan is big. 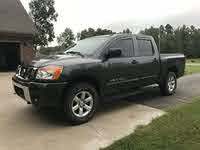 It compares to trucks like the Ford F150 and the Toyota Tundra, but it sells so few that it doesn't really compete. 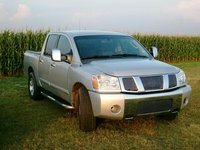 The Nissan Titan has been praised for its roomy, comfortable interior, wide rear doors, and other unusual features. However, it has been criticized for not offering as many body styles as similar trucks. The Titan has been plagued with quality issues, particularly with the brakes, which tend to wear out very quickly. 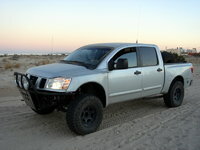 A heavy-duty Titan, to compete with the likes of the Ford F250/F350 or the Dodge Ram 2500/3500, is rumored for 2009.